Binary Scam Alerts is continuously receiving complaints about the Free Money System and Walter Green (AKA The Green Machine and/or Millionaire’s Blueprint). We have previously reviewed this SCAM and conducted an in-depth investigation as to how this cheating software, Autotrader, and App has tricked thousands of people into funding broker accounts. False advertising, inflated bank accounts, staged offices, and fake actors are just some of the tricks employed in order to lure innocent traders into a web of lies and misery. But rarely do we hear what happens afterwards, and how the brokers use this very sophisticated scam in order to force a bonus on innocent day traders. First of all Walter Green does not have any social profile. We checked him out and this person is a ghost. Furthermore, this sales video is packed full of actors. As you can see “Anthony Pitts” is in fact “Josh” from the Trade Tracker Pro Scam. Moving forward, this sophisticated scam does not show you any form of software, or for that matter anything at all besides numbers on some dashboard and overly theatrical second rate actors posing as as winners. Finally, this video has been so used and abused that they actually created a different sales page called Millionaire’s Blueprint and wrapped it around this video. This extremely sophisticated and highly deceptive production is designed to do one thing only. Get you to register and fund a trading account with a binary options broker. There is absolutely zero transparency and in reality you don’t get to see software or any system. Word of caution, when you sign up it is NOT for the software. In reality you are registering for a broker, but since this is not a transparent process you may not even be aware of this. You will be contacted via phone and some sleazy sales rep will try to get you to deposit and force a bonus on you. This is because the bonus has a trading requirement on it (also known as trading volume requisite) and it cosmetically inflates your balance. Once this is done your chances of actually winning (which are slim anyway) are reduced to zero or close to it. Now at some point a “senior broker” will contact you and try to sell you some strategy. That won’t work and using tools like market sentiment, scalping, candle sticks charts, bollinger bands, and momentum on 60 second options or ladder will be futile. You must recognize immediately that you made a mistake and these things happen, but in order to remedy the situation you have to cut your losses and leave. If you continue with this shameful scam then you will eventually be left bankrupt and extremely frustrated with your inability to actually profit from trading binary options online. Yes, but they will ask you to fund a trading account with a minimum of $250 in order to get started. A bonus or comp is a way for a broker to allow you to top up your capital, but there is a catch. Technically speaking there are 2 types of bonuses – the first is called a “Sticky Bonus” and will only allow you to cash out your winnings less the bonus amount. The second one can be withdrawn, however the trading requirements on it are much higher. This is the amount of times a bonus has to be traded in order to qualify for cashing it out. It is usually between 20 and 40 times depending on the type of bonus and the broker. Generally speaking if you can avoid accepting it then it is best, however if you must then never take over 10% and don’t be ashamed to haggle with the broker and lower the requirements. Sometimes it is just technically not possible, so check alternative brokers with a lower requirement before investing. These include but are not restricted to: Drexel Code, Tauribot, Citidel, Push Money App, Centument, Virtual Income, Insured Profits with Dave and Ginny, Sydney System, TSI System Scam, My First Online Payday, TrianaSoft, Trade X Confidential, Limitless Profits, Millionaire’s Blueprint,Trade Tracker Pro, Binary Matrix Pro, the Amissio Formula, Tauribot, Centument, and Citidel. There are new systems coming out on a daily basis and they guarantee instant wealth at the click of a mouse. The vast majority of these apps turn out to be scams and fail to deliver the promised good. 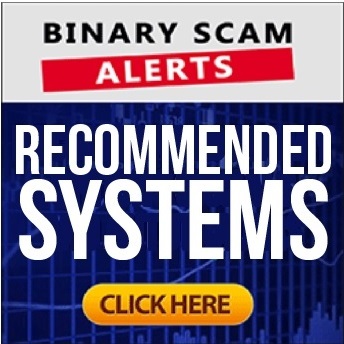 Binary Scam Alerts endorses the Binary Profit Method as it’s preferred Signals provider. If you are looking for an Auto-trader please check out automated trading section. After investigating one of the biggest online binary options investment scams The Free Money System and Walter Green (AKA the Green Machine), we have decided to warn our customers, members, and subscribers and advise them to stay away from this software. If you have invested or accepted a bonus from a broker, try to have them take it. If this is not possible then just learn from this tragic mistake and move on. As always we would like to invite you to join our Facebook group and Subscribe to our YouTube Channel.